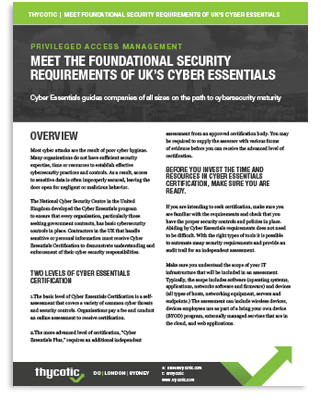 The UK’s Cyber Essentials program is designed to ensure that every organization has basic cyber security controls to curtail negligent or malicious behavior. If you are seeking government contracts in the United Kingdom, you must receive Cyber Essentials Certification. Abiding by Cyber Essentials requirements does not need to be difficult. With the right types of tools it is possible to automate many security requirements and provide an audit trail for an independent assessment. Thycotic security controls limit access to sensitive information and curtail an attacker’s ability to circulate unhindered throughout your IT environment. See how our privilege account management solutions map to UK Cyber Essentials.